“An eyeball…fell down into my lap, and that is gross!” exclaimed Dr. Uta Landy, the founder of Planned Parenthood’s Consortium of Abortion Providers (CAPS), a speaker at the National Abortion Federation (NAF) conference. The audience laughed. “…[T]he fetus is a tough little object, and taking it apart, I mean taking it apart, on day one is very difficult,” relates Dr. Susan Robinson, an abortionist at Planned Parenthood Mar Monte, who demonstrates how she uses forceps to pull babies apart during abortions. “You know, sometimes she’ll [fetal parts buyer]tell me she wants a brain, and we’ll, you know, leave the calvarium in ’til last, and then try to basically take it, or actually, you know, catch everything, and keep it separate from the rest of the tissue so it doesn’t get lost,” taught Dr. Deborah Nucatola, who described in this video how she beheads babies so their skulls and brains can be sold. In earlier videos, Dr. Nucatola casually discussed various abortion techniques used to better obtain fetal body parts that are of the “quality” necessary to sell. The video goes on to expose Planned Parenthood officials‘ willingness to sell what remains of the life they have destroyed. “The truth is that some [clinics]might want to do it [sell fetal tissue]…to increase their revenues. And we can’t stop them,” submitted Deb Van Derhei, National Director of Planned Parenthood’s CAPS. “I know Planned Parenthood sells a lot of stuff to people,” proclaimed Dr. Paul Blumenthal, Medical Director Emeritus with Maryland Planned Parenthood. What “stuff” would they be talking about? Baby clothes? Diapers? Or parts of babies? And let’s not call them “baby body parts.” They are referred to as “fetal tissue.” What is a “fetus”? A fetus is not some special species. This term does not identify what a living organism is. It is simply a stage of development. An unborn baby is not a fetus; he or she is just at an age that we refer to an individual as a fetus, similar to referring to someone as toddler, teenager, young adult, adult, and senior citizen. But what other “stuff” can we harvest and sell? Dr. Ann Schutt-Aine, with Planned Parenthood Gulf Coast, educated the undercover investigator how she avoids violating a partial-birth abortion ban. A partial-birth abortion is conducted by delivering a live baby, but assuring that its head is not out of the birth canal. Inserting scissors into the base of the baby’s skull, its brains can be sucked out, prior to removing the rest of the head. The law banning such a procedure was upheld by the Supreme Court in Gonzales v. Carhart in 2007. However, other methods of abortion are still legal to destroy an older, unborn child. “There’s a lot of clinics that we work with that, I mean it helps them out significantly,” explained an unidentified StemExpress employee about this technique to avoid the law against partial-birth abortion. As exposed in the previous videos, StemExpress is one of the brokers who help Planned Parenthood market baby body parts. “It’s not a matter of how I feel about it [the baby]coming out intact, but I gotta worry about my staff and people’s feelings about it coming out looking like a baby,” worries Dr. DeShawn Taylor, previous medical director of Planned Parenthood of Arizona. In the second video: Planned Parenthood’s Dr. Mary Gatter joked, “I want a Lamborghini,” as she negotiated the best price for baby parts. In the third video: Holly O’Donnell, a former StemExpress employee who worked inside a Planned Parenthood clinic, detailed first-hand the unspeakable atrocities and how she fainted in horror over handling baby legs. In the ninth video: catches a Planned Parenthood medical director discussing how the abortion company sells fully intact aborted babies – including one who “just fell out” of the womb. In the tenth video: catches the nation’s biggest abortion business selling specific body parts – including the heart, eyes, and “gonads” of unborn babies. 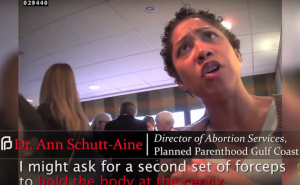 The video also shows the shocking ways in which Planned Parenthood officials admit that they are breaking federal law by selling aborted baby body parts for profit. 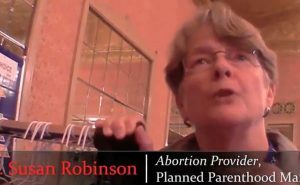 The 11th video: catches a Texas Planned Parenthood abortionist planning to sell the intact heads of aborted babies for research. Amna Dermish is caught on tape describing an illegal partial-birth abortion procedure to terminate living late-term unborn babies which she hopes will yield intact fetal heads for brain harvesting. The 12th video: shows new footage of Jennefer Russo, medical director at Planned Parenthood in Orange County, California, describing to undercover investigators how her abortion business tries to harvest intact aborted babies’ bodies for a local for-profit biotech company and changes the abortion procedure to do so. On March 28, 2017, California Attorney General Xavier Becerra announced that 15 felony charges were filed against David Daleiden and Sandra Merritt of CMP. 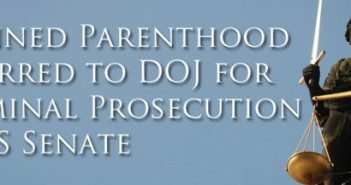 “The public knows the real criminals are Planned Parenthood and their business partners like StemExpress and DV Biologics – currently being prosecuted in Orange County – who have harvested and sold aborted baby body parts for profit for years in direct violation of state and federal law. I look forward to showing the entire world what is on our yet-unreleased videotapes of Planned Parenthood’s criminal baby body parts enterprise,” responded David Daleiden. 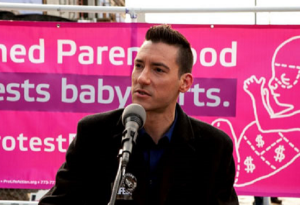 It is noted that David Daleiden also had criminal charges brought against him in Houston, Texas, and as a hearing date approached, the prosecutor (a longtime public supporter of Planned Parenthood) was smart enough to abandon the fake criminal charges prior to being made a fool of in a court of law. Only last January, a Congressional panel of the U.S. House of Representatives recommended numerous criminal referrals against Planned Parenthood. California’s Orange County District Attorney is pursuing action against two companies for their involvement in the marketing of fetal body parts. One of those companies, StemExpress, was held in contempt by Congress last year for its refusal to comply with this investigation, reports The Wanderer, a national Catholic newspaper. Where in California’s constitution is there a right to privacy? Where is it stated in the laws of California that it is a foundational right in a free democratic society? When are criminal charges based on someone’s political rhetoric? When is it a crime to record a conversation when no one at the time claimed or thought that it was confidential? Were any of the videos of confidential conversations? In fact, most of the conversations were anything but private. One of the first videos took place at a restaurant at which Dr. Nucatola was eating a salad and drinking wine, while she discussed “crush above” and “crush below” procedures to obtain valuable body organs, so that she could kill the baby without ruining the baby’s commercial value. Waiters and other patrons were well within earshot. In the latest video, the discussions were either public or made on the convention floor where one could view lots of people standing near and walking by while the conversation was being videotaped. It has been recently disclosed that U.S. District Judge William Orrick, who had issued a gag order preventing the release of the videos, has served on the board of directors of an organization that houses a Planned Parenthood clinic. As reported by lifesitenews.com, Judge Orrick is a former board member of Good Samaritan Family Resource Center (GSFRC), having served as its secretary in 2001 when it entered a “key partnership” with Planned Parenthood of San Francisco. Attorneys for CMP filed a motion seeking the removal of Judge Orrick from this case. As The Federalist’s Mollie Hemingway uncovered, “He also donated more than $5,000 to GSFRC.” “He raised at least $200,000 for Obama and donated $38,800 to committees supporting him, according to Public Citizen,” reported Hemingway. One of the teams of attorneys leading the courageous defense of David Daleiden is the Thomas More Society president, Tom Brejcha, and one of their top litigators, Matt Heffron, who was our speaker last year at the Celebration for Life. Consider sending them a note of encouragement, along with financial support (Thomas More Society, 19 S. LaSalle St., Suite 603, Chicago, IL 60603, web: thomasmoresociety.org). Although the Republican congressional leadership promised to defund Planned Parenthood, they, even though they control both the Senate and the House, have failed to do so. Why is it so difficult to defund Planned Parenthood? Could it be that a percentage of the millions of dollars it receives from the government is reinvested in electing those, in both parties, who will continue the flow of taxpayer money to this abortion giant? A ray of hope lies in President Donald Trump’s proposed budget, which would prohibit Planned Parenthood from participating in any federal health program. Unlike the legislation pending before the U.S. Senate, which would only defund Planned Parenthood under the Medicare program, President Trump’s budget goes even further. As most people can well remember, President Obama, Hillary Clinton, the Democratic Party, and the mainstream pro-abortion news media, promulgated the lie that if funds were cut from Planned Parenthood, it would be unable to do mammograms. However, as it was soon pointed out, none of the Planned Parenthood affiliates have a single mammogram machine to x-ray for breast cancer. The truth of the matter is that its “breast exams” are simply a check a woman could easily do on her own. Planned Parenthood does not do biopsies, CT scans for cancer, endometrial biopsies, or any other basic cancer screening. It only does Pap smears and STD testing; even then, only some of the Planned Parenthood affiliates do Pap smears and STD testing. Thanks to the U.S. taxpayers, Planned Parenthood realized another $77.5 million in profits. Rest assured that some of this money will find its way back to the campaign coffers of members of Congress so that some members of Congress can continue representing Planned Parenthood, instead of their taxpaying constituents.